Check out our new "green" to-go containers! We’ve switched all of our to-go containers to be more ecologically friendly! From coffee cups to straws, each container has thought behind it. The utensils are made from plant sugars! The slick coating on the containers is a corn-based polymer instead of a petroleum-based plastic. 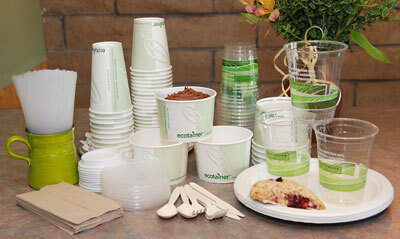 The whole line is made from renewable resources and is compostable! Website for more about Ecotainers.